Strix isn’t perfect. Shocking but true. I first discovered his primary imperfection when I went wandering to Oklahoma and have just now performed the first mod to address the problem. 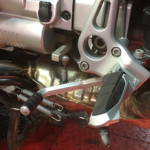 The problem – the foot pegs on Strix are too high. To be clear, it isn’t that my legs are too long; the foot pegs on Strix are simply too high. After about an hour of riding with my knees bent too sharply they begin to hurt. With this problem in mind I set out to find a solution. The solution was a journey in and of itself but it appears I have found a workable solution. I keeping with the methodology applied in Astronomia Nova, I present you with my much more concise “War on Foot Pegs”. First of all, my test ride on Strix was fairly brief but quite exciting. Strix is a modern version of my beloved Airhead, Otus, and he was priced to sell. The decision was easy because Strix was also largely unmolested. I wanted to own a motorcycle that did not need to its previous owners’ molestations reversed. What I did not realize during the brief test ride was how different the seating position is between the two motorcycles. So began the project to lower the foot pegs. 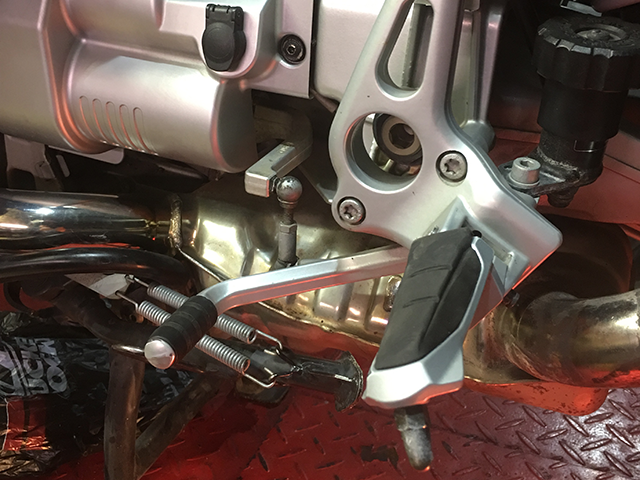 Lowering the foot pegs on a motorcycle is, generally speaking, an exercise in spending money. 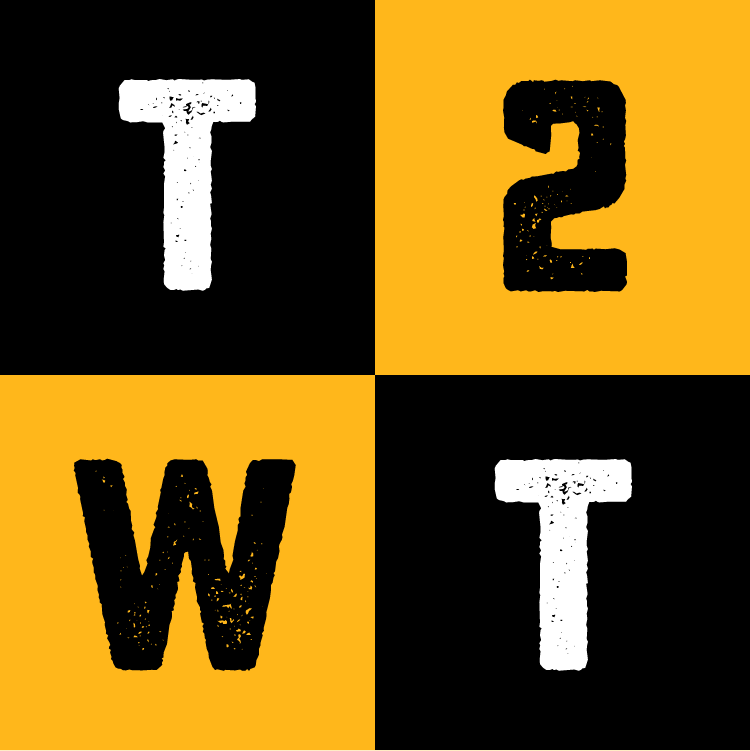 The challenge with this exercise is the same challenge all BMW owners face because you must remember – the cheapest thing on a BMW motorcycle is the rider. With this constraint in mind, I began looking for options. 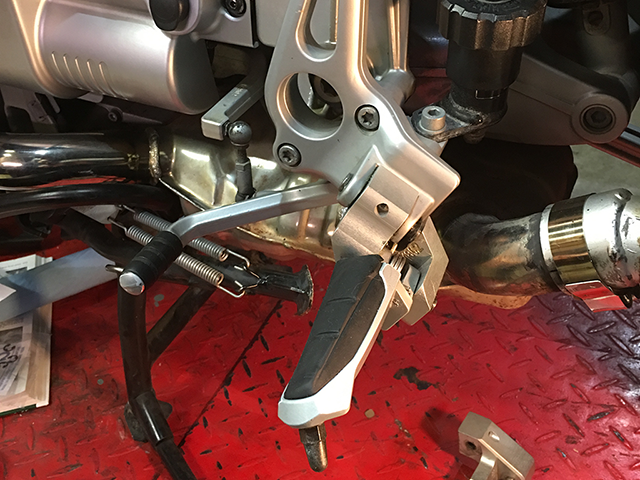 Fortunately there are several options for lowering the foot pegs on a 2003 R1150R. Unfortunately I had no direct experience with any of them, so I started doing online research. Online research presents its own challenges. To take liberties with Newton’s Third Law of Motion, for every opinion, there is an equal and opposite opinion. So, for every passionate solution, there was a reaction at least as passionate against the solution. This was true for basically every forum, article, and suggestion I read. I read several more, got discouraged, and gave up on the Internet opinions and went to my local BMW dealer to talk to the parts manager about options. This turned out to be the correct approach. The discussion was brief and the recommendation was simple – they install a Suburban Machinery peg lowering kit on a high percentage of the BMWs they sell. Unfortunately they didn’t have any kits in stock so I would have to wait if that’s what I wanted. That said, the parts manager asked me to wait while he looked for something. 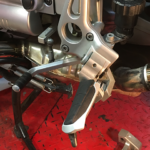 What he found was something like the Wunderlich lowering kit but without the gearshift/brake lever extensions. The kit appeared to have been previously installed, returned, and had been sitting in their inventory for quite some time. As I consider myself a “resourceful scrounger” (a polite term for cheap skate) I bought the bits and returned home to install them. The installation was simple once I determined how best to compress the return springs and I was riding Strix with lowered pegs with less than an hour of shop time invested. So what’s the verdict? So far, so good. This kit moves the pegs to the same height (from the ground to the top of the peg while Strix is on the center stand) as Otus – about 14″, and moves them out about 1.5″. I need to do some additional adjusting of the gear shift and rear brake levers but I think this has solved my peg position dilemma. What I didn’t mention – along the way I considered buying an RT and selling Strix. I even test rode an RT and seriously considered it as a more comfortable, long-range bike. Fortunately (or perhaps unfortunately) for Strix, test riding the RT was disorienting. The bodywork is big, when I turned the front wheel it was disorienting to see the bodywork remain stationary while the handlebars moved, I couldn’t find the mirrors at first, and the linked brakes were an unexpected scare. While the RT features a more comfortable seating position and greater range due to a larger fuel tank, it doesn’t have the soul of a BMW ’03 (apologies to Richard Thompson for that misappropriation of his masterwork).